Because you can find outdoor furniture everywhere from big box stores and online message boards to fine decor boutiques and your neighbor’s sidewalk sale, it can be tough to sift out quality from poor imitations. If you find the former, you will have a beautiful and practical addition to your property that will last for many years; with the latter, you will find yourself cheated and potentially lying in a pile of broken materials. In other words, a low price is great, but quality is key. 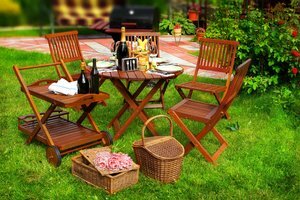 Here are the signs of quality lawn furniture every shopper should know. When it comes to furniture, nothing beats good, solid wood. Many cheap pieces you will find in stores are made with plastic or vinyl covered with artificial wood grain. You might also encounter furniture with a hollow wooden surface or fake wood grain lining on compacted wood chips. Solid pine and cedar, meanwhile, will hold up through time and heavy body weight. Give it a solid knock; it should sound hearty and thick. That is the sound of quality. High-quality furniture looks well-built. You might pay more for expertly crafted pieces, but they always deserve a higher price tag. Look for smooth lines, clean edges, a lack of flaws (bulging nails, scratches, splintered wood, peeling paint, etc. ), and evenly painted or finished surfaces. Lawn furniture is not just furniture you put in your lawn; it has to be built with the elements in mind. When you shop for outdoor furniture, look for detailed information about how the pieces were weatherproofed. Without proper protective treatments, the wind, sun, rain, heat, and cold will warp and rot your furniture. You should want to use your lawn furniture regularly! The highest-quality furniture for any room is not only attractive, it calls out to you. You should want to lean back, lie down, rest your elbows on it, and feel at home in it. Cheap furniture feels flimsy, hard, or otherwise unfit for human use. Nothing looks more beautiful than real, high-quality furniture. No machine can make what human hands can, after all. Good craftsmanship and smart design make a great first impression. Quite simply, good outdoor furniture should capture your heart on first glance. Lawn furniture can only do so much. Do not spend hundreds upon hundreds of dollars on a single piece. There is a point at which you are beyond paying for quality and are instead paying for a fancy, well-known brand name. Sure, cheap furniture is not a good investment, but ultra-high-end furniture cannot propel you into space or cure diseases. Ignore pieces you will spend years paying off and instead look for quality lawn furniture with good value to match.